Does your child struggle to read? Does that struggle cause your child anxiety or embarrassment? Are you confused by the mixed messages you get from teachers and other professionals? In this blog, I’ll be interviewing Faith Borkowsky, a Certified Wilson and IDA Dyslexia Practitioner about her book, Reading Intervention Behind School Walls. This book is a must-read for parents and educators alike. Her perspective and research offer a framework for understanding and addressing a complex and far-reaching crisis in America: our kids don’t read as well as they need to in order to succeed. Her book is clearly written with concise chapters that cover a broad range of diverse aspects of reading issues and their respective remedies. Faith will discuss what parents need to know to help their children and what educators can do to make better use of the precious window of time they spend with their students. Don: You start your book by describing your process of working with your student Robert. As a struggling reader myself, I was touched by your specific attempts to build trust with this struggling reader and help him relax and not have such a stress response and defeatist attitude. What can you tell us about your interventions with Robert, and why were these actions so important? Faith: We cannot separate the mind from the body. By putting children at ease and into a positive state of mind, it opens the learning channels. Robert and I began with movement exercises that crossed the midline of the body, such as bringing his left elbow to his right knee when the leg is lifted and then repeating with the opposite elbow and knee. Then, I taught him how to focus on his breath to clear his mind. We spent a few minutes “warming up” to build a mindset for learning. I told Robert that he can be in control of his learning when he has control over his mind and body. Slowly, he began to trust me, and more importantly, he began to believe in himself. Don: What Butterfly Effect (a small action that has a far-reaching effect) has decimated American literacy? Faith: Beginning in the 1930’s, reading programs began to focus on comprehension and the memorization of whole words instead of a phonics approach. Phonics took a back seat and was only supposed to be used as a last resort. Prior to this, reading was taught through spelling books that were sequential, and the alphabetic code was learned through letter patterns that were explicitly taught. As a matter of fact, reading, spelling, handwriting, and grammar were all taught directly. Children were not left to “discover” how to read words. In the 1950’s, Rudolf Flesch wrote a book called Why Johnny Can’t Read, advocating for phonics to be brought back as the primary instructional method because so many children were not learning by using this whole word memorization approach. He was not very effective in changing minds. In the 1970’s, the Whole Language approach was being taught at teaching universities, and it became the dominant teaching method. When I started teaching in the mid 80’s, anything that included phonics was removed from schools. Open Court, a basal reading program that used a phonics approach, was abandoned. Teachers were not supposed to emphasize phonics. Spelling was not taught by letter patterns anymore. Words were given to the class weekly that reflected misspellings noticed in the children’s writing or which were based on holiday words and themes. Children do not always make the connection between sounds and letters if phonemic awareness and phonics are taught separately. Don: In your book, you describe the gap between assessments of struggling readers and actually using that data to improve instructional choices. How can parents be more pro-active in this area so their child doesn’t fall through the cracks? Faith: Since 2002, as a result of the No Child Left Behind Act, lots of testing and progress monitoring took over the schools. This was supposed to keep teachers and administrators accountable for making Adequate Yearly Progress (AYP). But testing alone will not change the outcome if the instruction does not change. Parents need to ask questions and find out what the school is doing instructionally to change the trajectory. Usually, children are just given more of the same methods that did not work for them. Assessing children without analyzing and responding appropriately to the results is a waste of time. If a child can’t decode, using an instructional approach that does not teach phonics explicitly will not work for that child. Don: In the chapter called “Visual Discrimination” you state that “there is no substitute for the personal connection of someone with a true interest in your well-being making simple, everyday activities meaningful and educational.” What sorts of activities can you share that you benefitted from as a child? Faith: I mentioned in the book that basic family chores can be a learning experience. My father and I used to sort his socks by color and pattern. My mother and I would take public buses, and I was the one responsible for paying the fare. I learned the difference between nickels, dimes, and quarters by using them, not by a picture in a book. We also rolled coins to bring to the bank for dollar bills. I was fortunate that I had many hands-on experiences, and my parents were very much hands-on with my learning. Today, children are handed phones and iPads with very little interaction between parents and children. I see a difference in children who are in front of screens too early and too often. Don: You talk about how using sight-words encourages kids to develop guessing habits when reading. I appreciated your statement that sight-words don’t teach kids how words work. Why is learning how words work so crucial? Faith: When children understand the alphabetic principle, they can apply phonics skills to read ANY word, short or long. If they just learn to memorize words, they might learn just those words but will not see connections to unknown words. For example, a child might memorize the word stop, but that same child will not be able to read slop, prop, or crop if those words were not seen before. Children should not be left to “discover” how words work. Don: You have some excellent exercises in your book for parents to use to determine if or how well their child can read, and if they may have a visual tracking problem. Would you please share those with our listeners? Faith: Inefficient instructional methods can cause tracking problems. If a child is searching for meaning and not reading left to right and all through the word, his eyes may be bouncing all over the place to search for cues that can help. However, if a child can decode isolated words but cannot read those same words embedded in the text, there might be a true tracking issue. Parents should watch while their child is reading. Are just their eyes moving or is the head moving as well? Do they notice head tilting? Body posture can be very telling. Don: Reading comprehension is a big topic, with multiple aspects. But you stress the role of parents in this goal. You specifically mention continuing to read to children even after they have learned to read, even more so if they have learning challenges. Why is this so important? Faith: Content knowledge and vocabulary both directly affect reading comprehension. Children who know a lot about the world and have a large bank of words are better able to understand what they read. This is especially important for children with decoding issues. If reading is difficult, they will not be able to read books with more complexity and sophisticated language. Until decoding skills are strengthened, children benefit greatly from hearing books that they cannot read on their own. Don: These days, there’s an app for everything, and it may seem more expedient, even more effective, for a parent to turn their child over to something designed by a professional. Why are computer-assisted instructional programs not as effective as a real teacher for the remediation of reading difficulties? Faith: I believe that children thrive when adults are giving them attention. There is no substitute for the human voice or physical closeness. Computer programs can be helpful for repetitive practice, but I don’t think that putting children on the computer is an effective use of time. Children become passive learners on these programs and the novelty wears off quickly. Don: You discuss the importance of attitude in reading success. You specifically mention a distressed mindset and a defeatist attitude. How can parents help their child move to a more positive, hopeful point of view? Faith: Modeling positivity and becoming a role model for having an optimistic outlook are the best ways to build the right attitude for learning. Parents should reinforce the message that their own brains have plasticity and can change at any time. There is always the opportunity to learn something new. As mentioned earlier, mindfulness strategies can be learned and are effective in building focus. I learned many techniques and have studied the benefits of using a combination of movement and mindfulness to help children concentrate. Don: Your encouragement to parents to optimize the time spent together as a family at the dinner table by not having devices present struck a chord. Why does having electronic devices present during mealtimes pose such a problem? Faith: Language is the foundation for literacy, and listening comprehension precedes reading comprehension. Learning to follow and engage in a conversation are fundamental skills that underscore reading and writing success. What better place than at the dinner table? Plus, it is just rude! Don: Faith, thank you so much for taking time from your schedule to share a wealth of information with us! Our readers are sure to benefit! 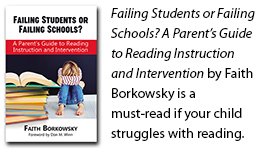 As you can see from this brief interview, there is abundant targeted information to be had from Faith Borkowsky’s book, Reading Intervention Behind School Walls. Don’t miss this opportunity as a parent or educator to make a meaningful difference in the life of a struggling reader. Click here to purchase Faith Borkowsky’s book on Amazon. If you’re looking for a series of exciting adventure books that help reluctant readers, take a peek at the award-winning Sir Kaye series published by Progressive Rising Phoenix Press. Faith Borkowsky is the Founder and Lead Educational Consultant of High Five Literacy and Academic Coaching. With thirty years’ experience as a classroom teacher, reading and learning specialist, regional literacy coach, administrator, and private tutor, she has seen first-hand what truly works. Ms. Borkowsky is a Certified Wilson and IDA Dyslexia Practitioner, is Orton-Gillingham trained, and has extensive training and experience in a number of other research-based, peer-reviewed programs that have produced positive gains for students with Dyslexia, Auditory Processing Disorder, ADD/ADHD, and a host of learning difficulties. New York State-certified in Elementary Education, Special Education, and Reading, Ms. Borkowsky stays current, is always learning, and continually attends professional development in brain-based, holistic disciplines. Honing her skills over years and redefining strategies through trial and error, she has been a trainer in school districts across Long Island and has presented at literacy workshops and conferences for federal and state-funded initiatives. Her philosophy and practice include educating and empowering her students to be self-sufficient learners. Ms. Borkowsky works with all ages, preschoolers through adulthood, utilizing meta-cognitive strategies and multisensory instruction in a collaborative, non-threatening style, where parents are welcomed and encouraged to participate in the learning process. As always, you did a superb job! !